The software CSMdataconv and the data loggers UniCAN 2 and 3 form a powerful team. UniCAN data loggers provide the recorded measurement data via mobile data transmission (mobile communication or wireless LAN) or via LAN to an (S)FTP server where CSMdataconv is installed. The software then automatically takes over the server-based data processing routine. This process is often applied to manage larger vehicle fleets (fleet management). CSMdataconv converts the data into the required format - e.g. MDF, CSV or ASC - and then makes it available for evaluation and further processing. Different types of segmentation are available in order to specifically facilitate the administration of larger data volumes. This makes it possible to sort and divide the converted data sets, for example, according to date and time, start and end of a measurement or the period of time in which a trigger is active. The concept consists of three components based on each other. You decide which functionalities can be remotely accessed on your UniCAN 2 and 3 data loggers. UniCAN 2 and 3 data loggers equipped with mobile communication modems and UniCAN 3 with optional wireless LAN functionality or standard LAN interface generally allow remote maintenance. This enables data loggers to receive licenses, firmware updates and new configurations. Also, it is possible to let the logger send a sort of status report in the form of a SOM file (“Sign-On-Message”). 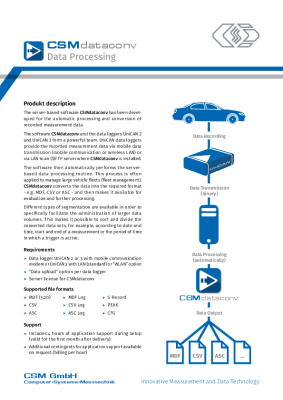 An option can be purchased for each CSM data logger that enables the mobile upload of measurement data. This allows the transmission of the recorded raw data to a server. The upload of the data and the creation of a folder structure are performed automatically, the further processing of the data, however, has to be carried out manually via CSMuniconf. A server licence can be purchased for CSMdataconv, making it possible to automate the further data processing. Customers, who want to make use of this CSMdataconv feature, purchase one server license of the software and one upload option per data logger.